I had a very difficult time finding mirrors that have an antique feel for my house. I do have a few antique mirrors, but couldn’t find exactly what I wanted for my vanity and for the bathroom, so I found some mirrors that were pretty close, but needed some tweaking. 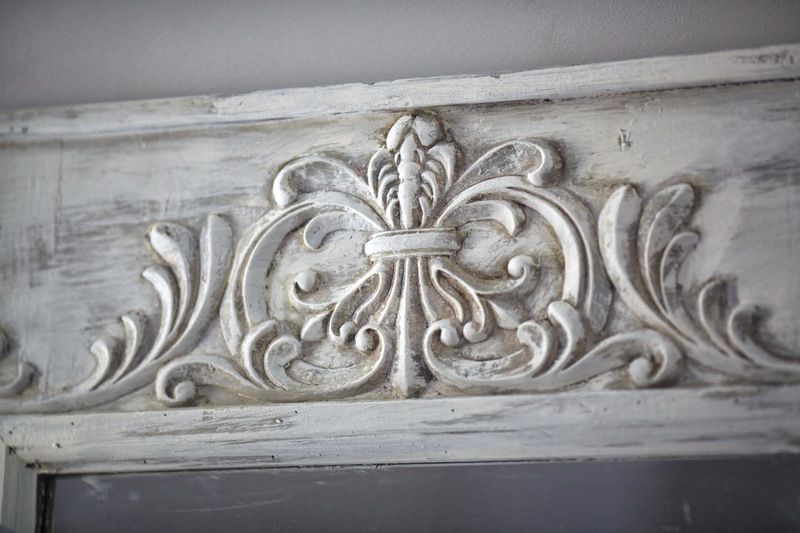 I painted this mirror with Annie Sloan chalk paint in old white and Paris Gray. Then I used antique brown Fiddes wax on the mirror. Here it is after the first coat of paint. Want to know where I found it? At Hobby Lobby! I think it turned out lovely. Here are my other mirror bargains. 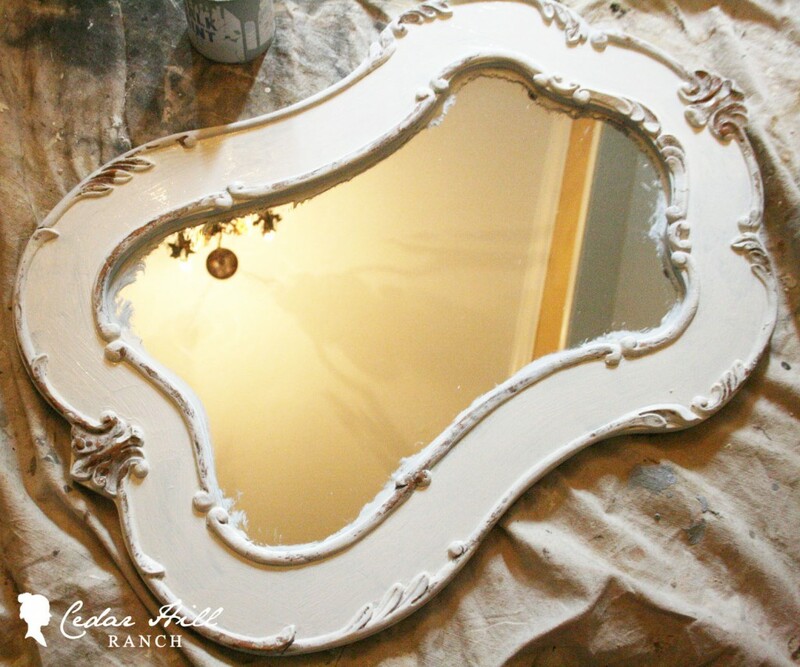 Some people think they are antique, but matching antique mirrors are almost impossible to find. These are actually new. Of course they didn’t look like this when I found them. I used the same technique to transform these mirrors as well. Here’s what they looked like in the store. And after an initial coat of paint they looked like this. If you guessed that I found these at Hobby Lobby as well, you are correct! So if I find something that is a fabulous price, that has good bones, but just needs some paint, I’m usually game to buy it. I admit I was nervous about how these would turn out, but now that they are on the wall, I’m pretty pleased. They are FABULOUS!! Great finds and Great job transforming them! Wow! What transformation. And don’t you look cute in those jeans and fabulous boots??? Thanks for the inspiration – again! These turned out lovely Anita ! I liked the original look , but in your house this really works. Thanks for sharing. 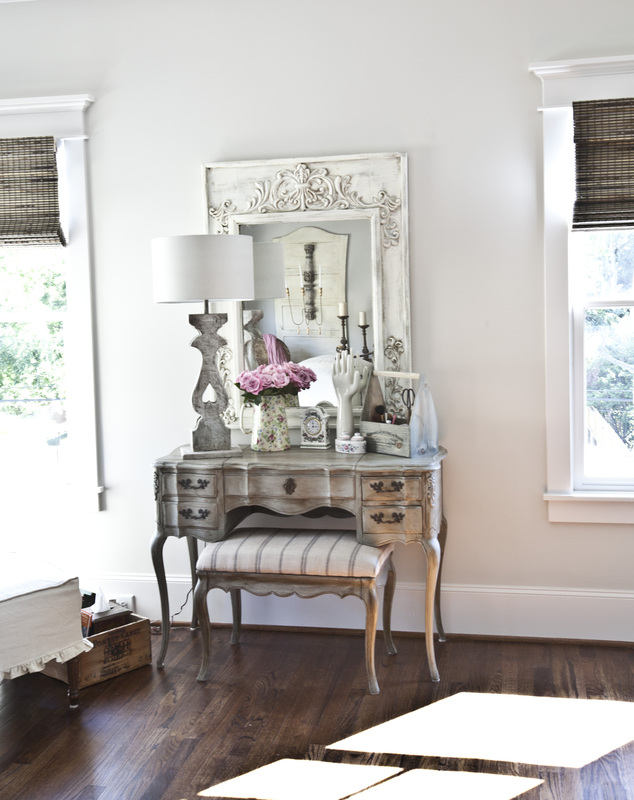 I love the combination of gray and white with the brown wax to give it an aged look. I just painted a cheap gold trimmed mirror yesterday I got from Dollar General. 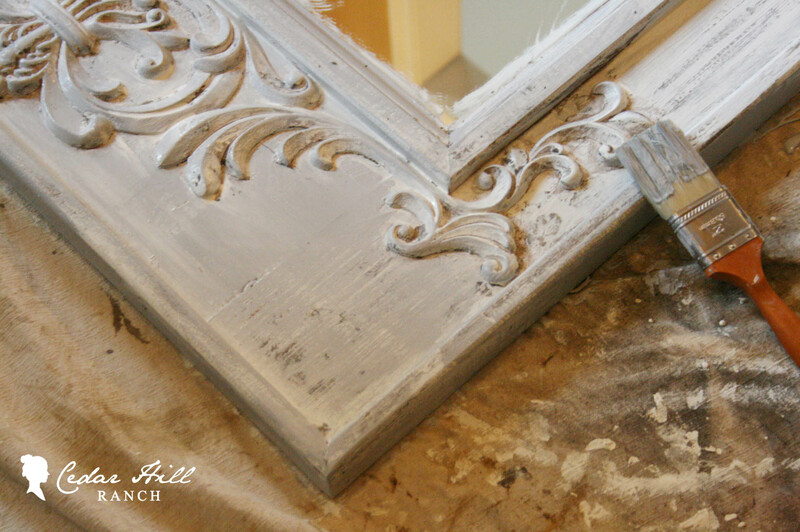 I did it in my home made white chalk paint, distressed it and used a combo of dark & clear waxes. It turned out really well (esp considering how cheap it was) but I think I’m going to add some gray chalk paint and re-wax. Thanks for the inspiration!! Anita, they turned out great. I even like the original color of the second one. great idea, they look like they got off the boat from France!! Love what you’ve done with those mirrors and Anita! Fabulous transformations!!! I have purchased several things from Hobby Lobby and transformed them with paint. Their items have ornate looks that I want but I do not like their finishes at all. You can’t beat the prices when they have a sale or have coupons, lol. Anita, Beautiful job! the only think that paint won’t fix is a husband! Luckly I found a man that doesn’t need fixing. And I found him 47 years ago. OH boy do I love those mirrors you redid. They look so much better being white. I saw the comment above about rehabing a $general mirror, I’ll have to take a look at our $gen. They don’t get much of that kind of thing. I used to buy so many great house decorating items at one close to us in KY but the stores here (western CO) don’t carry all the good stuff anymore. Pooh. I do find nice things at Family $ however I could redo. I wait til they put things on clearance rack and I grab em in a hurry. Great job on your mirrors. Lucky finding two. I bought the first mirror to use in my dining room. Loved the mirror but the finish did not work for me either so I painted it a French blue then glazed over it. 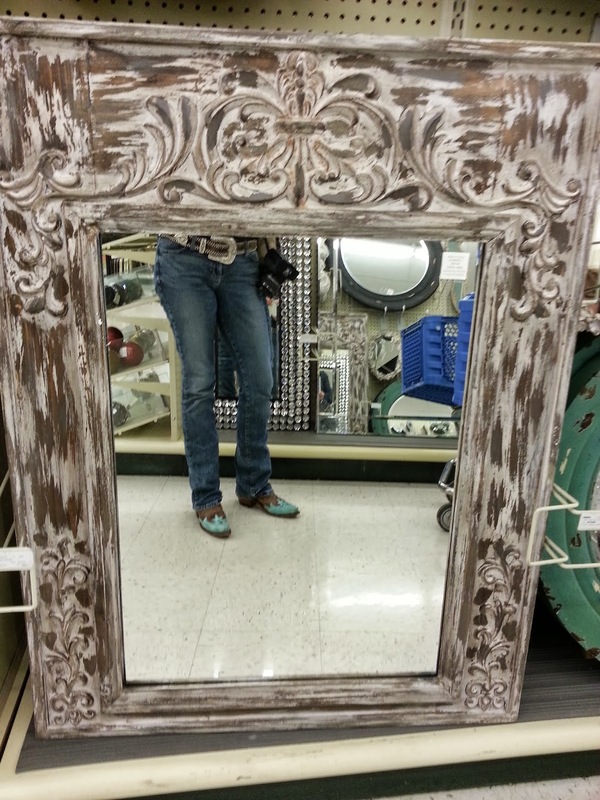 I have my eye on the second mirror too for my guest room. 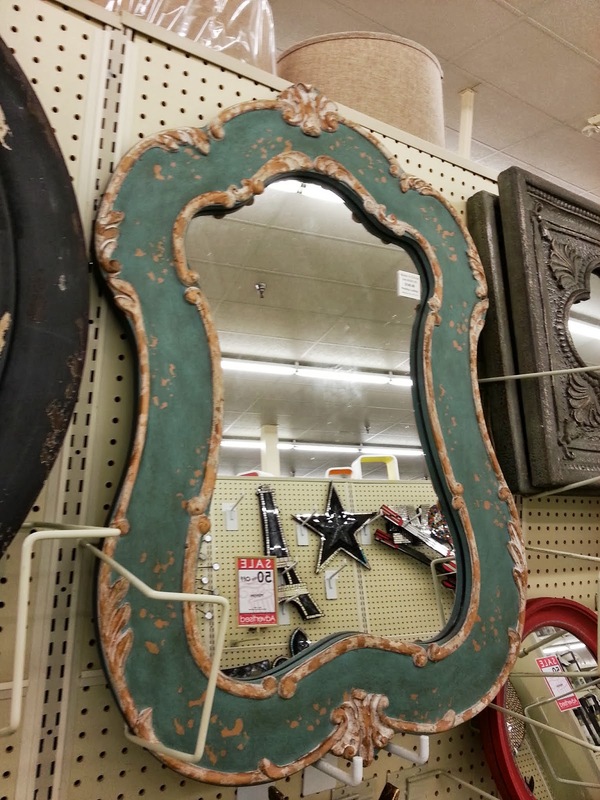 I don’t usually shop Hobby Lobby for mirrors but lately they have had a nice selection. Thanks for sharing all the pictures of your beautiful house. Hobby Lobby hm~m~m. . .guess I’d better take a closer look at home decor there!!! 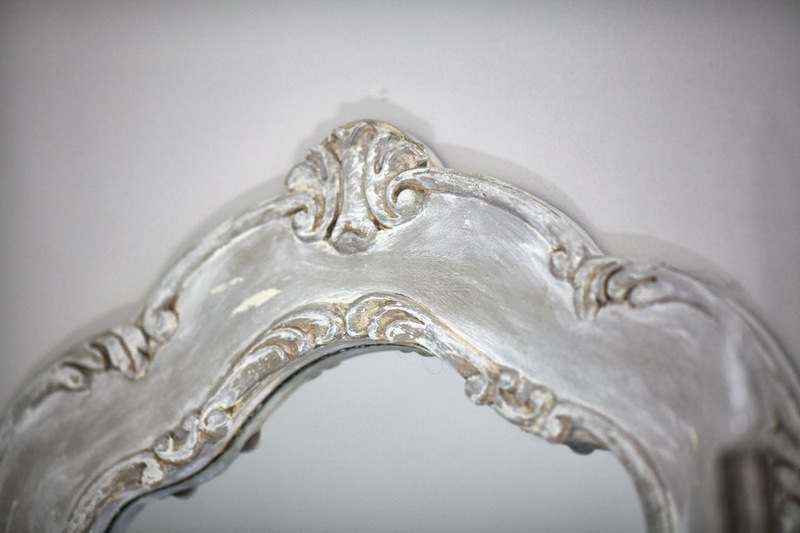 Loved the first mirror in old white, did you dry brush the Paris grey after 1st coat of old white? Did you use clear wax then the brown wax? Love the wall color too- can you share the color and mfg? OMG!!! So beautiful, you did a fabulous transformation. The pair in the bathroom are just awesome! Would you share with us at WIW? 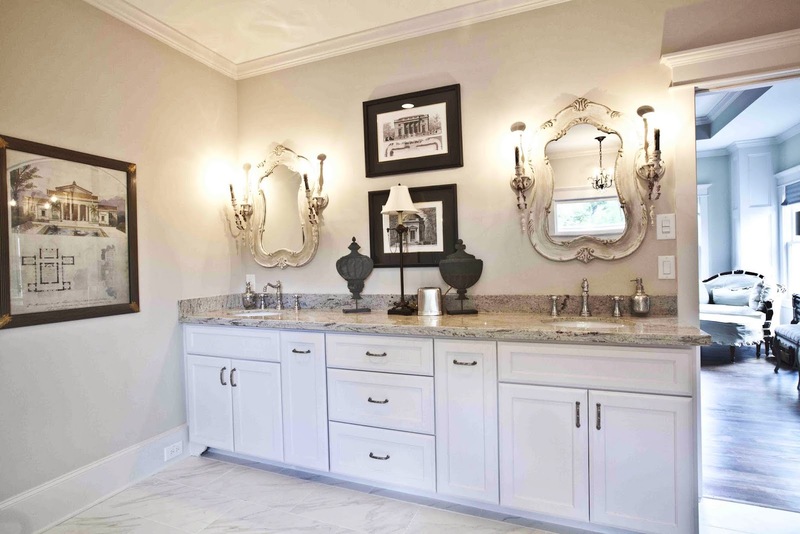 Love the magic you did with these mirrors but I also love the sconces beside the mirrors. Are these true antiques or did you also age these as well. If so could you share that too? I have a set that are really too new looking that I have tried to age but I still don’t like them. Any ideas would be appreciated. Oh I think I told you wrong in my email to you. The mirrors in the bathroom came that way, they are not antiques. I thought you were talking about the sconces in my bedroom. Absolutely beautifull Thank you for showing how to do it. You have inspired me to no end with your mirror projects. I can’t wait to find some bargains and create my own “antiques”. Hi Anita…I just stumbled on your site. Beautiful job!!! So did you mean the sconces are antique or did you find them in a retail store? They are just what I am looking for to match a chandelier I have. The bathroom sconces are new. Anita, do you remember the colors you used on the vanity? Was that Old White and Paris Gray, too? I’m soon to redo a desk turned vanity. I like the color. Thanks! Yes I used both of those colors then used antique brown Fiddes wax on top. 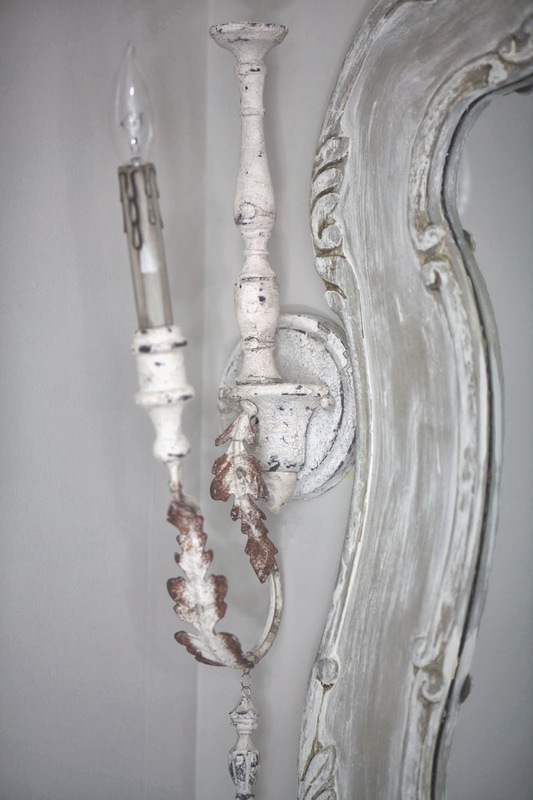 What source did you use for the bathroom sconces? Thanks! Can you tell me the dimensions on the first mirror please? Which one is the first ne Alysia? If it is the rectangular one, I sold those and don’t have them any more. Today we have Kelly on the back porch. 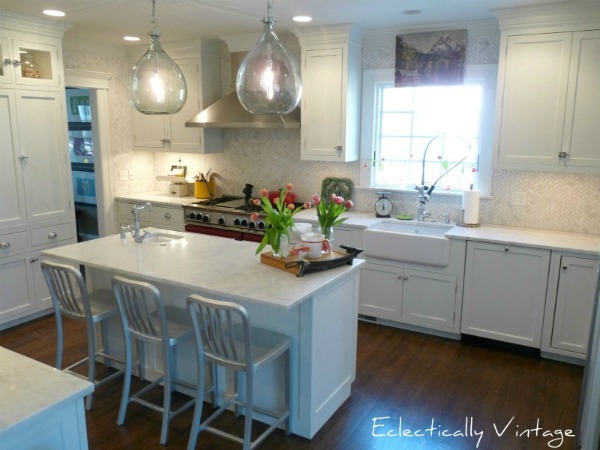 She has a very popular, way cool blog, Eclectically Vintage. I’m so happy to have her here, and let’s here what she has to say. Thanks Anita for welcoming me! I’m Kelly of Eclectically Vintage and I’m thrilled to be hanging out here today. I had never read a blog before I started my own. My neighbor started a food blog and it sounded interesting so we met at Starbucks so I could pick her brain. Over a hot chocolate with extra whipped cream (I don’t drink coffee), I started my blog on a whim. 2. What was the most exciting thing that has happened to you because of your blog? When Country Living magazine asked me to be one of their “pros” and contribute some of my favorite tips and tricks to their magazine, that was a definite moment to remember! 3. What is your dream gig or do you already have it? I only started loving vintage about 10 years ago – before then, I thought new was better. I love inappropriate humor (although I think most of my readers can guess that)! Eclectic with a modern twist. I love taking something old and something new and combining them for a singular style that’s all mine. 6. What are your 3 Favorite Posts? Luckily, I was able to create my dream kitchen so that’s a biggie. 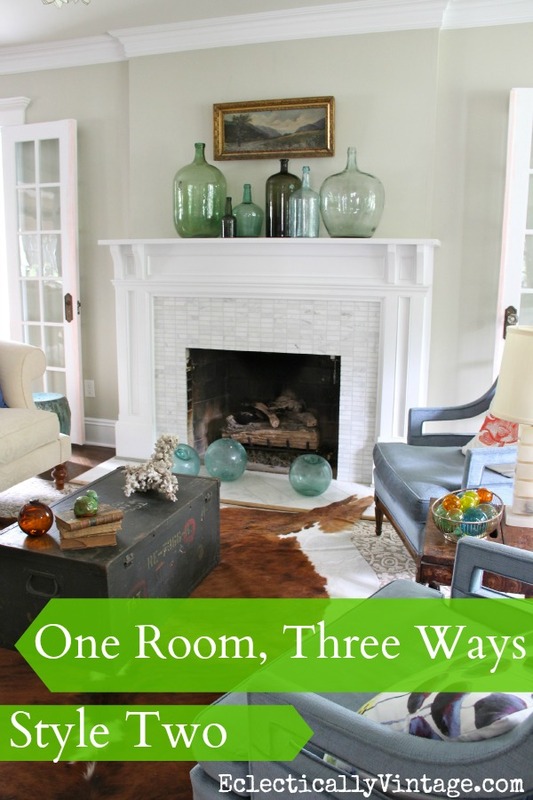 My One Room, Three Ways post was fun. I created three completely different looks for my living room (all with things I already owned). 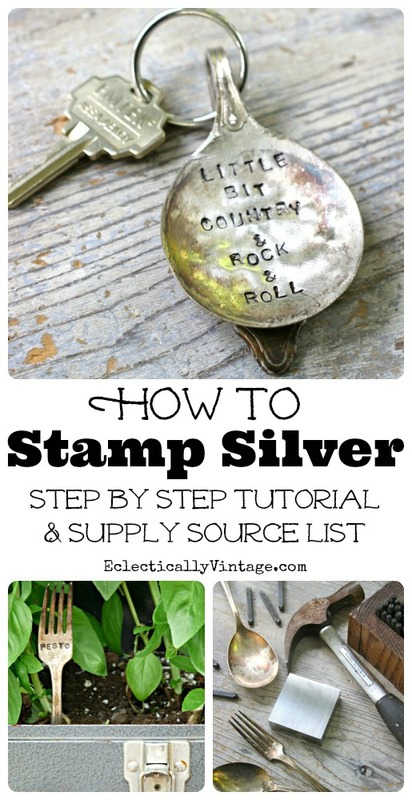 I love sharing my simple projects so I do love my How to Stamp Silver post. 7. What advice would you give new bloggers? Be unique! Don’t copy anyone else’s style and just do what feel right to you. Get to know other bloggers and form a support group – I’ve met so many gals I’m thrilled to call my friends. And lastly, if it’s not fulfilling and becomes a chore, don’t do it. Thanks Anita – I truly enjoyed stopping by your amazing blog. Be careful because you may just find me sitting on your farmhouse porch one day! Visit me at Eclectically Vintage – I may even mix you up a mean margarita! Oh yum! Thanks so much for the visit Kelly!! Did you miss any of the interviews? You can catch up here. Also be sure to check my tour of Cedar Hill at Debbie Doo’s blog today. Oh, I so adore Kelly and her blog…she is definitely a wonderful person with a blog to match…she inspires me everyday!…Great, great feature….Have a great weekend Anita and Kelly! Love Kelly and her blog. Kelly is so much fun to visit. Love her blog and her sense of humor! Kelly and her inappropriate humor (which I think is appropriate) cracks. me. up. and one of the first things I started looking for at garage sales is big jugs so I can duplicate her island lights. Great feature Anita, Kelly is one of my favorites. Not only is she a fellow Jersey Girl, but she has so much talent and creativity. Love her blog and projects!! I read Kelly’s blog and she is a hoot. Love her style too!